I am very excited to share with you all the new project I am taking part in: The Forward Fashion Project created by Bib + Tuck, a private online community for fashion bloggers, designers and street style. Read about them on Vogue.com . Every week, each blogger receives one piece to style. All the pieces will be rotated to each blogger , in this way we can see how a piece can be styled in different, personal ways. with another pattern for a bold and playful result. Until next week, when I will receive the next item to style ( I am curious to find out what it is ). Stunning, I love this look soo much, my dear! Amazing look!. Kisses from Spain. great combo! I love it!! You look sensational! Love all the prints! Nice combination!! !The blouse is awesome! Amazing outfit! Love the bold prints and colours! Nice project,i’m looking forward to see the upcoming items and looks! Oh dear, you look amazing!!! u look fabulous!! the prints are so contrast but looks amazing together ironically!! maybe, you ll makesome changes and wear as shorts in the summer. ıt will be very nice shorts from it..
You look so goog with this outfit. I love how you styled the outfit you look amazing & the pants are so lovely! Unique, chic and wearable. Way to think outside the box. Love it! thank you very much ladies! Those are some bold pants, but I absolutely adore that polka dot blouse! wow, you did a fabulous job! i love the “power clashing” that you did. and the pants definitely look fabulous on you! Oh wow, your trousers are such show stoppers! This outfit makes me smile, I love it! Wow! Those pants are stunning. And I love them paired with the polka dots. Such a cool and unique look. you look great doing the print on print trend! WOW, this project sounds so cool and I love how you put this outfit together. I just found your blog and you have amazing style, the polka dot top is SO perfect. love your outfit!! i ‘m following you from google friends and i will be happy to follow me back !! You blew me away with this look cutes! Seriously was not expecting jam packed colour and double polkas! LOVE! It’s amazing!! In love with it! I love these colors, great outfit. Your shirt is so lovely. Your outfit is so nice! Like this! This is a whole lot of everything, but you make it seem so effortless. Ceau Vera ne plac pozele tale,asteptam poze noi si te pupam si pe tine si pe Bogdan. felicitari pt poze. really love these bold outfits of yours…it takes so much style to do them!!! !love it!!! A complete visual delight…M loving it..the pants are crazy cool..so unconventional too..
u styled them the best..
I’m loving your look, it’s beyond great and that blouse and clutch are stunning! Dear u did wonderful job! This is original, refreshing, unique and so interesting combination!! I can’t wait to see which piece u’ll style next!!!!! Brave print mix! but looks really fresh and nice! OOh, i loved your blog! Gorgeous u look! WOW! congrats on this fantastic opportunity dear!, I’m so excited to see all the pieces you’re going to wear, this is a bold look and you managed to make it look so chic. How awesome that you are a part of this!! I love the polka dot top and scarf and the bright red on the pants! Lovely styling! I love this- so patriotic and chic at the same time! Get out of town! These pants are freaking unreal! congradulations…you look AMAZING I love this outfit is my new favorite! such an amazing experience! I’m sure you’ll style everything better than anyone! you are a magician. there is no way in hell most girls can pull off those pants. you look absolutely stunning! wow those are some bold pants! The project seems to be really awesome! I’m curious to see how other bloggers style the same piece. Here I def like the combo of patterns! That is so cool and you look amazing in your outfit. Thank-you for visiting my blog and I will be following. Can’t wait to see future posts! I love your shirt soo much!! It´s really good you are wearing spanish designer´s pants!! amazing look!! the pants are gorgeous!! Congrats!! Such an amazing outfit!!! Very unique style! Fantastic look dear! I love the way you styled those pants! los pantalones son geniales!!! la blusa es preciosa!! Wow Veronica! You look ah-mah-zing! Your look from head to toe is just a riske and right on target. I know you felt great in this look. I love everything about this outfit! It’s gorgeous and so chic! I want all these pieces! Your style is awesome! 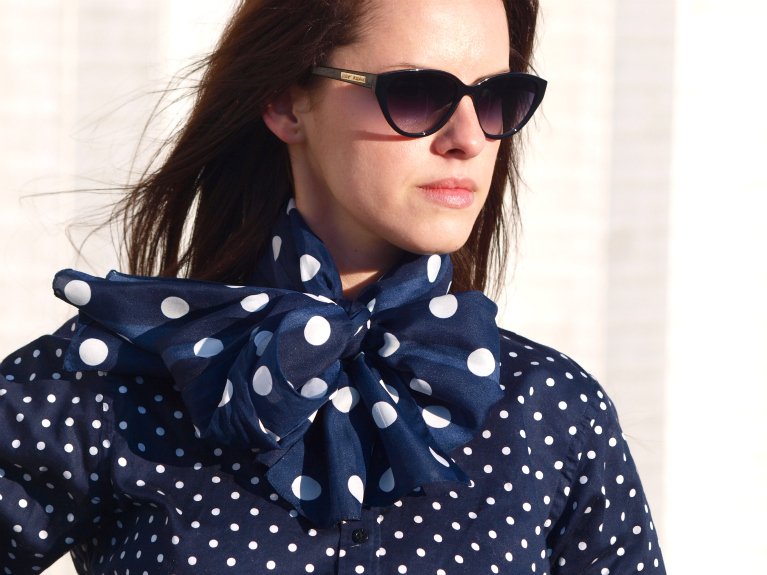 i love the blouse and the scarf, the competing sizes of polka dots, but in a way, the two patterns, though mismatching in a way, are almost too matching… reminds me a bit of a fourth of july tablecloth. the styling works for this blog, but i cannot really imagine wearing these pants out and about, then again, i’ve been in an intense fashion rut and wearing only black lately….. sigh. Amazing outfit! Love combination of prints! Pants is awesome!